Concert as part of the 8th edition of the "Portes Ouvertes Consolat" festival. A proposal by the Association POC and La Boîte à Musique. 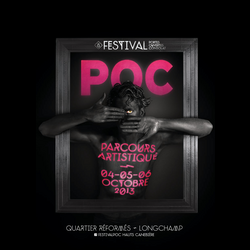 Organised each year during 3 days in October, the Festival POC is a cultural event based on the promotion of plastic arts and artists within the Hauts Canebière area. The event revolves around an artistic itinerary proposed to visitors in fifty spots opened especially for the occasion: associations, shops, restaurants, theatres thus become original and surprising places of exhibition. Art galleries and workshops also open their doors to the great joy of the most curious people! A friendly and improvised scene, the closing jam session will take place outdoors, in front of the Galerie Andiamo. It gathers the various live performing artists (musicians, singers, dancers) who participated in the "Impromptus" over the week-end. Galerie Andiamo, 30 cours Joseph Thierry, 13001 Marseilles.